Following the release of the first public beta for iOS 9.1 yesterday, along with the GM version on Wednesday, a few of the testers have come across a new feature introduced in the update. Somewhere in the Settings app, it appears that Apple has quietly added a set-up process for the new "Hey Siri" feature coming to the iPhone 6s and iPhone 6s Plus, thanks to a built-in M9 motion coprocessor that enables the phones' always-on functionality. Although unconfirmed by Apple, the discovery in iOS 9.1 suggests that Siri will be able to begin detecting specific user voices and determine whether or not the owner of the iPhone in question is speaking to her. Similar in vein to the way Apple aimed its Touch ID feature to work better and better the more you unlocked an iPhone using the fingerprint scanning sensor, it seems the set-up process will guide users into stating words or phrases to better acclimate Siri with each iPhone owner. 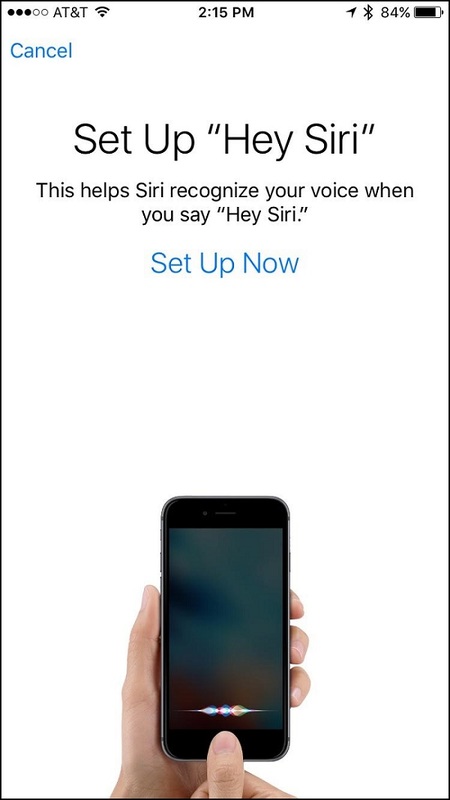 Found in General > Siri > Allow 'Hey Siri', the new always-on feature is the next step-up in the technology by Apple, allowing users to ask Siri questions or make changes within the iPhone's apps by simply stating "Hey Siri" near the iPhone. The new set-up process discovered today could also just be a way for Siri to work better detecting voices in general, and not be specific to each user. With the iPhone 6s and iPhone 6s Plus launching in just two weeks, it won't be long until everyone can find out for themselves. Makes sense, if they didn't do this you could say hey siri ... and everyone's iPhones would come to life around you. Because it has a new M chip. Without it your battery would be dead in a couple of hours. Don't think so. The new M9 coprocessor probably has some kind of connection to the mic which the M7/M8 does not have and therefore would kill your battery. If I have two devices with hey Siri activated in the same area, both react... A possible solution would be that if two devices (with same iCloud account) get activated by the voice command, each one would give that information to the other devices before Siri reacts, and then determine the nearest by the voices level each device receives. Then only the nearest could respond. Another option, instead of voice level detection could be to let Siri ask you on each device simultaneously which one was meant by asking for the device type (iPad, iPhone, etc...): "On what device do you want to ask me something?" - "iPad"
Seems like allowing us to customize the phrase would be easier or more reliable than Siri being able to differentiate between people saying "hey, Siri". This is similar to getting a phone call and getting the ring on the watch, phone, ipad, and mac all at the same time. although that may be worse since it totally drives me crazy. And when I answer I have to wait for a second or two for all the other devices to shut up (this has gotten better - it use to be several long seconds). Maybe this explains why my iPhone didn't respond to "Hey Siri" last night. The problem is that with the 6, the processor had to be active all the time to listen out for "hey Siri" - it physically wasn't something the M8 could do as M8 had no direct connection to the microphone. The M9, however, would appear to have direct access to the Mic so the processor doesn't have to be involved and can therefore remain in a lower power state. I'm not disputing what some people are saying that you could achieve the same end result in the 6 with additional battery drain, but that's not the same as saying this could be done solely with the M8 in the 6 if that's what you're suggesting. Bummer. I mess with my wife sometimes by saying "Hey Siri" while we are both in bed which causes both our phones respond. Though last time she responded "tell Bob to f**k off", to which Siri responded by drafting an iMessage to my dad with that text in it.